When I was young I always went to Sunday school, sometimes twice every Sunday – morning and afternoon. It doesn’t seem to be such a regular practice these days, so I thought I would write a little about it. Here is a newspaper cutting I found, I am the child second right, at the back. There is no date on the clipping, but I would estimate it to be in the late 1960s, I look around nine or ten. For some reason I have absolutely no memory of this occasion at all, which is odd because it must have been a big thing to have my picture in the local paper. It makes one wonder how many other memories are just lost in time. I can recognise most of the faces, which surprises me. Second left on the front row is my best friend Cathie. This links two different parts of my childhood. 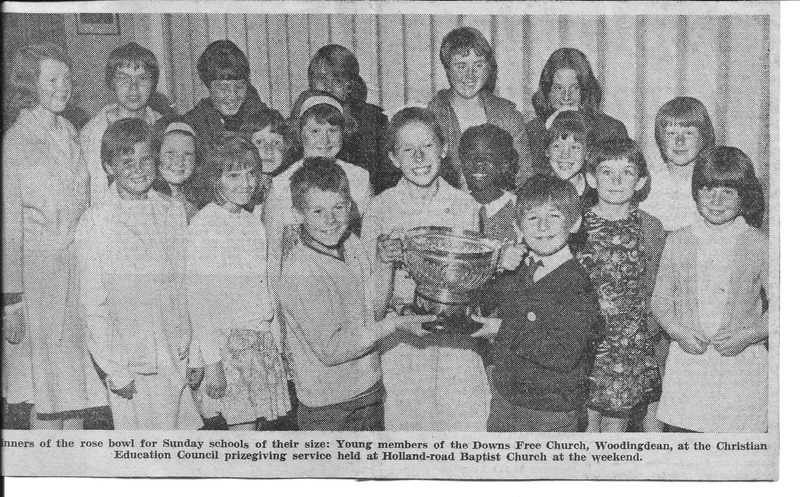 I attended Holland Road Baptist Church in my early years, when we moved to Woodingdean I then became a member of the Downs Free Church, returning to Holland Road Baptist Church in my late teens, after a few years in the Salvation Army. Once I became too old to attend I soon became involved in the teaching side, and became a Sunday school teacher. This was at both the Salvation Army, and Holland Road Baptist Church. I used to enjoy this, but found it hard keeping the children in my class occupied and attentive! This entry was posted in Churches and tagged Downs Free Baptist Church, Holland Road Baptist Church, Salvation Army, Sunday school, Woodingdean. Bookmark the permalink. Thanks Petra, hope to have the gas central heating back on this morning 🙂 One thing at a time! Thanks Mark, I’m just taking it slowly one thing at a time. Today’s mission is to get running hot water back on. 🙂 I’ve been through worse than this, I’m stronger than I look!